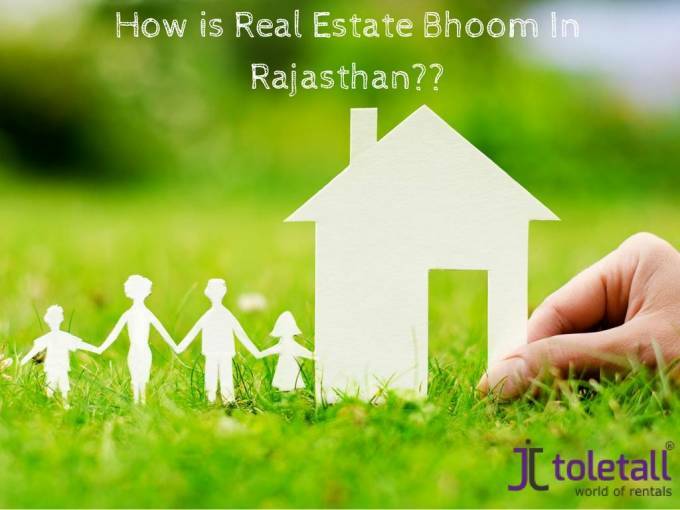 How Is Real Estate Bhoom In Rajasthan?? Rajasthan is the largest state of India. The state covers 10.4 percent area of country and is known as land of kings. It is experiencing an exceptional growth. With saturation setting in metros, the real action is now heating up in emerging cities. Real Estate in Rajasthan has taken unrivalled boom. In the recent year, the construction of residential and commercial complexes, shopping mall and multiplexes is increase to strengthen the infrastructure of this state. Property market in the area is increasing due to IT growth and this expected increasing availability of the residential and commercial property .There are mainly three places for Real Estate Bhoom In Rajasthan. The second largest city of Rajasthan, Jodhpur is witnessing a boom in the real estate sector. The real estate sector has seen a best growth in Jodhpur in last decade as not only the city has expanded in all directions, but new townships have also come up.Handicrafts and Tourism being the major industries, the city is known for its rich cultural heritage thus attracting a lot of people to invest in Residential Properties. Jodhpur is well connected to almost all top Indian cities like Delhi, Mumbai, Kolkata, Chennai, Bangalore, Pune etc. Jodhpur Airport is one of the prominent airports of Western India. Being in the center of Rajasthan State there are a lot of feasible properties in Jodhpur. Investing in property in Jodhpur is a profitable option for individuals as well as businesses as Real Estate development in Jodhpur is on a high. Also Read : How to choose a Real Estate Agent?? Jodhpur has a boom in the education sector in the new millennium as a lot of people from the private sector sought to establish colleges pertaining to degrees like engineering, management, pharmacy and dental. All of these institutions bought lands at some distance outside the city and raised their infrastructure there. In due time the area lying between the city and colleges gained demand and the prices of the land hover. Later on setting up of institutes of national repute like IIT Rajasthan as well as Ayurvedic University in Jodhpur added more momentum to it. The capital of Rajasthan, Jaipur, is considered to be one of the 10 mega cities of future India. Jaipur has always ranked high on the Indian and foreign tourist’s itinerary, and prospered not only because of its proximity to Delhi, but for the rich cultural package it offers to every visitor. Over the last decade, Jaipur has taken a leap forward from its culture and history to join the ranks of modern technology centres of reckoning in India today.The entry of various IT companies, solar energy units, and automobile manufacturing companies are making Jaipur the upcoming industrial hub. Real Estate in Jaipur is thriving at a fast rate. The no.of Real Estate Builders in Jaipur has also gone up. This growth can also be credited to the infrastructural developments and its proximity to Delhi. Let us have a closer look at these factors! The entry of big shot companies like Infosys, Cisco, Wipro, HCL, IBM, Daksh, Hinduja TMT etc. is a major part for growth in the Real Estate sector. Industry experts believe that IT sector is the biggest contributor of bringing Real Estate boom in Jaipur. Various hospitality projects from five star hotels like Taj, Hyatt, Radisson, and Hilton are also in the pipeline. The government of Rajasthan has also proposed the development of knowledge corridor and a sports city in Jaipur. Commercial spaces in Jaipur are being re-defined with landmark structures like the upcoming World Trade Park which will be equipped with retail, trade and business spaces, trading facilities, 5-star hotel, art gallery and museum, an auditorium and a convention centre. Udaipur is one of the booming real estate markets in the state of Rajasthan. The city is famous for its numerous tourist destinations that attract a large number of travelers from all over the world. The economy of the city and in turn real estate-everything in the city is dominated by its fast growing tourist industry. There are numerous Heritage hotels and resorts located in Udaipur offering wonderful opportunities for the investor to invest their money in real Estate. There are numerous commercial as well as residential complexes coming up in the city. The reason behind this is city’s highly improved infrastructure and basic amenities that are as good as any city of the world. Udaipur is easily accessible by road, rail and airways.Udaipur is also known as the “City of Lakes” with the presence of lakes like Lake Pichola, , Jaisamand, Fateh Sagar Lake, Udai Sagar and Swaroop Sagar. These lakes are famous tourist destinations. As Udaipur is frequently visited by national and international tourists. The residential and commercial areas are equipped with facilities like have 24 hour electricity and water supply. Apart from this, several markets, malls, multiplexes, etc. are developed in Udaipur. There are various healthcare centers and educational institutes available in Udaipur making it one of the most preferred destinations for owning properties. Both the private and government players have invested in the property market of the city. People with different financial status can invest in the properties of Udaipur depending on their choice. Also Read : What Are The Three Key Elements Of A Great Real Estate Investment? ?